Marion has a number of assets and programs designed to attract, develop and retain qualified workers for its diverse base of employers and prospective employers. From innovative workforce development programming to a track record of economic development success, Marion is dedicated to connecting employers with the resources they need to expand or relocate their business. 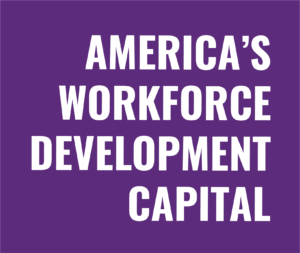 Below are a few of the many reasons why Marion, Ohio is America’s Workforce Development Capital! Marion is home to an “educational corridor” comprising Ohio State University-Marion, Marion Technical College, Tri-Rivers Career Center and the RAMTEC robotics automation training center — all within a square mile of one another. Marion City Schools also pioneered the Graduate Pathways to Success program, which enables students to choose one of three curriculum pathways to achieve a two-year degree or certification by the time they graduate high school. The program has been recognized by the Governor’s Office of Workforce Transformation and the Ohio Department of Education. Marion offers customized training programs to help develop skilled workers suited to an employer’s unique needs. With the help of JobsOhio, Marion Technical College received a $500,000 mobile training lab to teach new skills to a developing workforce. With the capacity to train hundreds of workers every year, the 400-square-foot simulator can provide onsite training to local manufacturers, thereby reducing costs and time for companies and employees. The Marion Area Workforce Acceleration Collaborative (MAWAC) is forming in 2018 to ensure students and adult learners throughout Marion County have increased access to workforce development opportunities. MAWAC membership includes an equal number of Marion County secondary and higher education leaders as well as workforce development and business leaders. Together, they are focused on combining resources to shape programs that meet today’s in-demand jobs. For the second straight year, Marion was recognized as one of the nation’s Top 100 Micropolitans by Site Selection Magazine. Marion continues to attract interest from top employers throughout the world, and workforce development is one of the main reasons why. As part of the greater Columbus, Ohio metropolitan statistical area, Marion benefits from its proximity to one of the nation’s fastest growing and vibrant cities. Columbus is one of 20 finalists for Amazon’s HQ2 headquarters and is expected to grow by more than one million people by the year 2050. This helps Marion attract a diverse set of employers and workers who benefit from the many quality of life attributes the greater Columbus region has to offer. The community has a rich manufacturing heritage, from the invention of the revolving hay rake in the late 1800s to the engineering of a highly sophisticated “crawler” that carried Apollo Saturn V rockets and space shuttles to the launch pad for NASA. Marion’s Whirlpool plant produces millions of dryers a year, and the community is home to a number of industrial employers including divisions of Andersen Windows, Nucor Steel, Union Tank Car, and many others. It is also headquarters to Wilson Bohannon Lock Company. If you’re looking to expand or relocate to a community that’s dedicated to meeting your workforce development needs, please contact Gus Comstock at gusc@marioncando.com.